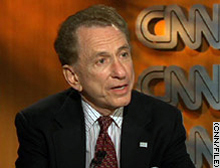 Sen. Arlen Specter took over as chairman of the Judiciary Committee in January. WASHINGTON (CNN) -- Senate Judiciary Committee Chairman Arlen Specter has been diagnosed with Hodgkin's disease but intends to continue working during treatment, his office announced Wednesday. "I have beaten a brain tumor, bypass heart surgery and many tough political opponents, and I'm going to beat this, too," the Pennsylvania Republican said in a statement. "I have a lot more work to do for Pennsylvania and America." Specter's oncologist, Dr. John H. Glick, said the 75-year-old senator "has an excellent chance of being completely cured." Glick is a professor of medicine at the University of Pennsylvania and an expert in Hodgkin's disease, a cancer of the lymphatic system also known as Hodgkin's lymphoma. "He is in superb physical condition, particularly in light of his daily squash regimen," Glick said in a statement. Approximately 7,500 cases of Hodgkin's disease are diagnosed every year in the United States, and Glick said it has a five-year survival rate of 70 percent. Specter, who took over the chairmanship of the Judiciary Committee in January, had experienced persistent fevers and enlarged lymph nodes under his left arm and above his left clavicle, his statement said. A biopsy of a lymph node carried out February 14 at Thomas Jefferson University Hospital in Philadelphia yielded a result positive for Hodgkin's disease, but a bone marrow biopsy showed no cancer, the statement said. Follow-up tests Wednesday at the University of Pennsylvania's Abramson Cancer Center determined that he has "Stage IVB" Hodgkin's disease. For the next six to eight months, he is expected to undergo chemotherapy every two weeks at the center, during which time he is expected to "be able to perform all duties of his office, including those related to the chairmanship of the Judiciary Committee," the statement said. Specter's form of the cancer is the most advanced, said Dr. Herman Kattlove, a hematologist-oncologist who works as a medical editor for the American Cancer Society. "But still, our success rate is quite good," he said. "Stage IV" means that the disease has spread outside the lymph system and is in another organ, he said. Specter's statement did not say which organ was involved. "B" means that the disease is accompanied by symptoms -- typically fevers and weight loss. The presence of symptoms also tends to worsen the prognosis, he said. Although Kattlove is not familiar with Specter's case, he said figures from the National Cancer Institute give a man of Specter's age and stage a 50 percent chance of surviving five years with the disease. But, he said, Specter's vigor and good physical condition could improve those odds. "I think he'll have a good outlook for the next few years," Kattlove said. "Whether or not he can be cured is up to luck and his health and good doctoring." Kattlove predicted that the senator's major problem while he undergoes chemotherapy will be fatigue. "If he were a bricklayer, I think he'd be out of work, but I think, as long as he keeps to a fairly limited routine, he should be able to perform well," he said. Each year, about 1,300 Americans die of Hodgkin's disease, according to the Mayo Clinic, but death rates have dropped by 60 percent since the 1970s. Also a member of the appropriations and veteran's affairs committees, Specter lives in Philadelphia with his wife, Joan, a former four-term city councilwoman. They have two sons and four grandchildren.